Combine flour, yeast, sugar & salt in a mixing bowl. Add warm milk followed by oil and egg. Beat with electric mixer on medium-high for 2 minutes. Stir in raisins and enough flour to form a mass (about 1/3 cup). Transfer to a floured surface and knead for 2 minutes, about 80 turns. Cover dough and let it rest for 10 minutes. Meantime combine brown sugar and cinnamon in a bowl and grease an 8 1/2 x 4 1/2-inch loaf pan. Roll dough into 12 x 8-inch rectangle. Brush liberally with milk. Top with the brown sugar mix, leaving 1/2-inch on long sides and 1-inch at far end. Roll tightly, starting at narrow end. Pinch both ends well to keep filling from escaping, and tuck under. Place seam side down in loaf pan, cover with a towel and let rise in a warm spot until it's one inch above the rim of the pan - about 40 minutes. Bake in preheated oven at 350° F for 30-35 minutes. After 15 minutes, place a foil tent on top of loaf to prevent over-browning. Loaf is done when interior measures 195-200° F.
Remove immediately from pan and cool loaf on a rack, on its side. No electric mixer? You can combine by hand but knead longer, about 5 minutes. Gaps inside your bread? See my blog post for more. Click here. 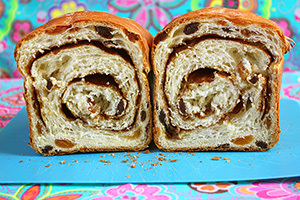 33 Comments on "Cinnamon Swirl Raisin Bread"
I enjoyed your show here in Ontario Canada. I made your Polish donuts, they were very delicious, light, with a multitude of air holes, were cute little puffs of goodness. Thank you very much for both. Jenny, love your channel. Can you please make a video of this bread? It looks soo good. Thank you for sharing your recipes. I am in the middle and my “dough” is so wet-the consistency of a batter! I’ve already added 1/4 C more flour. Pray for me, I’m going to add more. Anyone else have this problem? Alas. I read over the instructions AGAIN, and I had yet to add 1/3 cup more. I wish this amount were indicated in the ingredient list as such! Nonetheless, I had soaked my raisins in some Amaretto, so I also added 2 Tbs Almond meal to the dough… Yes, I drained the raisins and splashed back that juice! Time will tell what comes out of it. Update. OMG Delicious, light, and flavorful! Did I mention that I used cup-for-cup Stevia instead of the white sugar? The additional 1/3 cup of flour is indicated in the recipe. If your dough was too wet, it might have been from using stevia, but I’m glad it turned out in the end. I tried this still warm with homemade apple butter. I need to see video to make this. Is there a way you could show us a demonstration all video by any chance? Can I make the dough at night and then bake it in the morning? I love how quick and easy your recipes are to follow. And the results of the ones I’ve tried are always delicious.I hope you are doing well, love your videos. Can I just mix the raisins and cinnamon and brown sugar into the dough? What size pan do I use please? The pan size is indicated in step #7 and I only make my recipes the way I post them. For any variations, you would just have to try it out. Please share your results if you do. LOVE, LOVE, LOVE your recipes! I never had a problem with any of them, easy, healthy and delicious! I made your latest, cinnamon raisin bread yesterday, it couldn’t have come out better, (even if YOU baked it, ha,ha,ha). I, as many, miss your videos, please, please, please,Jenny, make some more! ……..have to go now, my morning coffee and cinnamon raisin bread awaits me. Thanks Jenny. Can’t wait to make this. Looks delicious. I think you like all the things I like, Jenny! This sounds wonderful for toast on a cold winter morning….or any other time. Thank you so much. Perfect timing for cinamin bread. Thanksgiving weekend would be perfect. I appreciate this recipe not using butter for health reasons. As always your recipes become a standard in our home. Thank you for raising the bar. thank you Jenny, Hilarious ! I was just at the grocery store with my husband and said boy I’d really like some raisin bread and a voila ! Can’t wait to try it. so much for making all your recipes easy for everybody to follow. Yoly T.
easy for everybody to follow. Yoly T.
Thank you Jenny. Love your recipes. Like Julia Child though, I think anything with butter is better. Do you see any issues with replacing the oil with melted butter and maybe even brush with melted butter instead of milk?? Me too! I swirl it just the same way. Now I’ll be trying it with the new instructions. Have you tried mixing in the cinnamon, raisns and brown sugar directly into the dough???? Your recipes turn out wonderful and I am certain this one will too. Can’t wait to try it! Was hoping you had put a video with this recipe, just LOVE your videos! So informative and entertaining. 🙂 Love your website. 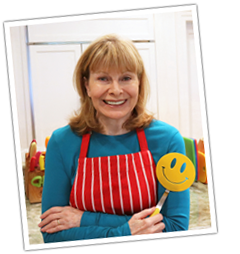 Jenny, Thank you for sharing your love of cooking and baking with us! 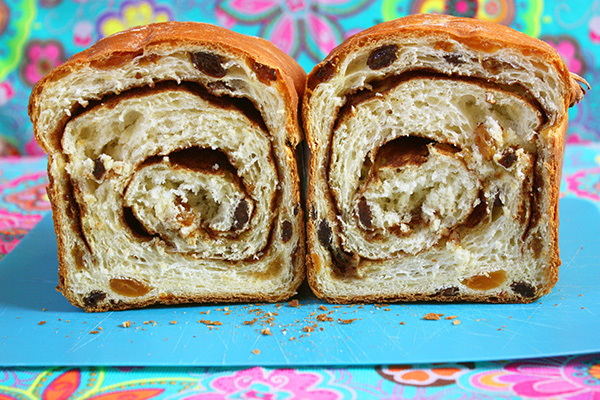 How wonderfully delicious does this cinnamon swirl raisin bread look?! My hubby LOVES this type of bread, it’ll be great on a chilly morning with a steaming cup of joe. I plan on baking it very soon, crossing my fingers for “small” gaps or better yet, none at all. Either way it’s going to be eaten! Thanks for posting another tasty recipe Ms. Jenny! Looks so delicious I can’t wait to make it. great cook.keep them coming God bless & thank you. Oh! Jenny, Perfect timing! I’m in the mood to bake a bread and this sounds fantastic. I can smell the wonderful aroma already. :)and for the up coming wonderful season. Be well!